When I was five years old and we lived in the house my parents bought when we first moved to Canton, there was a kid named Danny who lived in the yellow-bricked house next door. He was a year or two older than me and had a Big Wheel which looked pretty much exactly like the one up there on the shelf. Though I don’t remember this, my mom recalls that Danny charged me to ride it. I apparently paid in the only currency I had: Matchbox and Hot Wheels cars. Before Danny could totally clean out my tire-shaped Mattel Hot Wheels carrying case, though, mom and dad got me a Big Wheel of my own. Mine looked different, though – it was red, not orange, and had a plastic brake lever instead of a metal one with a plastic handle. The back wheels were wider, too, and the front wheel – the BIG one – was black and yellow instead of black and silver. It takes very little effort, even now, to remember what it felt like riding it; the smooth, molded plastic handgrips against my palms; the way the texture of a road or sidewalk transmitted itself through the seat and the wheel and the handlebars while I pedaled; the thrill of pulling up hard on the brake and turning at the same time to do a spin-out. When I was six, we moved to a new neighborhood, a dead-end street surrounded by trees and fields out in what my parents called “the boondocks.” My new neighbor, Rick, had a Big Wheel of his own, and even though we both knew how to ride bikes, these were the years when we really put our Big Wheels through their paces: plywood-and-cinderblock ramps; demolition derbies; endless races around a tight oval in our driveway. Eventually, we were too big to squeeze into the Big Wheels sitting down. No problem: We took off the seats and drove them by standing on the back and pushing with one foot, and man, could you get those things flying. Soooo much faster than pedaling, and easier to jump away from when the inevitable flip or collision came your way. Our Big Wheels mirrored each other in their decay. Busted brake handles; splits in the bases that caused the point just forward of the seat to scrape the ground; and the bane of practically every Big Wheel I ever saw, the one spot on the front tire that wore itself flat and made for an increasingly prominent “thump” with every rotation. 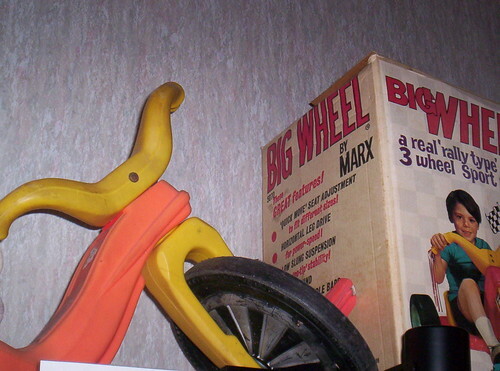 The last time I remember playing with my Big Wheel, Rick and I had tied it to the back of my bicycle with about twenty feet of rope. It was hard as hell for the person doing the pulling to get started, but once the bike was moving down the street, it took just a few slight flicks of the handlebars to send the Big Wheel rider on a massive crack-the-whip sweep, winging back and forth until the trip ended in a cloud of dust and gravel and someone rolling down the road howling in glee. That’s what I saw sitting up there on the shelf in an old building in Wheeling, West Virginia. Came across this while researching for a client’s Big Wheel tattoo, this post was a really wonderful read.